Such a lovely Black and White look! That is the cutest top!! I love it with white pants! I am appreciating white jeans more and more! Merry Christmas dear! Target really does have some cute items! I love this top and I just love it with the white denim! I really love that look, it's so pretty and I love those boots! Rachael, I absolutely adore this outfit! The black and white is picture perfect. That top is so pretty and perfectly paired with white skinnies and OTK boots. I wish you a very Merry Christmas! I hope you have a wonderful morning with your littles! I love that you are wearing white jeans for thew holidays! This top is so pretty, love how you styled this look! Really pretty top! Merry Christmas! Really love that top! Everytime I see someone styling their collection, I still wonder why I haven't bought anything from it. And I need to get on the wrapping asap! Have a nice Christmas! You nailed this black+white look. I need to wear my white jeans more for the Holidays. That Who What Wear blouse is so chic and I need it - you know I love their clothes. Merry Christmas to you and yours Rachael and welcome by and I hope the boys enjoy this special day!! The white jeans are totally perfect for winter when paired with these boots & top! I wore mine this week too! Really love that top!Merry Christmas! 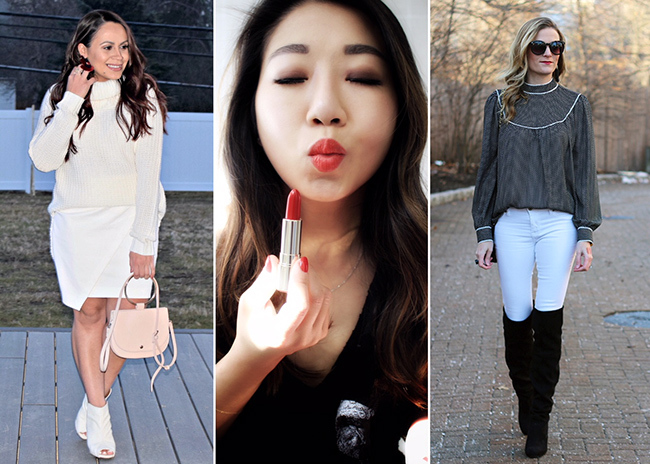 All about the white jeans for Winter whites! The top is so cute and I love the polka dots. It really pairs the whole look of white and black together! I am a big fan of white jeans year round too! They look amazing with your blouse! Hope you have a Merry Christmas! I absolutely adore white denim and I still have yet to purchase a pair for myself. I gotta change that soon, for sure. The blouse you're wearing is equally as gorgeous and it's all such a cute look for the holidays and beyond! i wear white denim year round too and love how you styled yours! Sweet combo of white denim and black OTK boots dear, really perfect for the top. I love how you styled these white jeans with the cute blouse. I feel like I like them almost more in the winter than I do in the spring. I'm so obsessed with this look! I love pairing white jeans with black OTK boots in the winter too! The look is so chic. I love how you styled everything. This outfit is gorgeous. I love the black boots over the white pants.